Announced late last year by the famous duo, the super swish Union Street Café in London is a joint venture between good friends David Beckham and Gordon Ramsay. 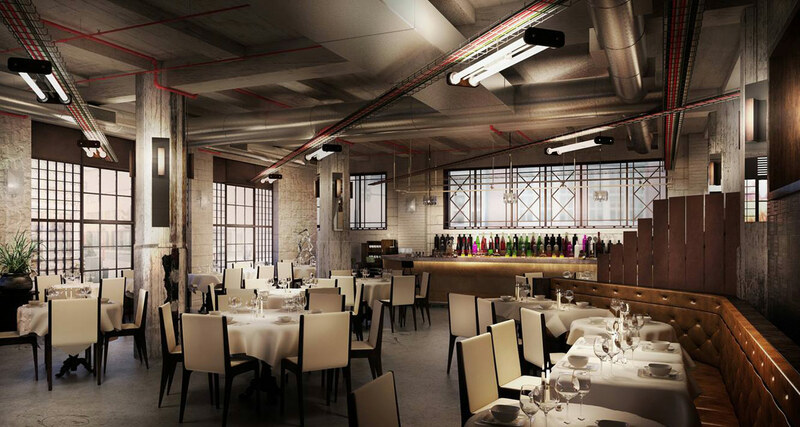 The restaurant is situated in Borough, just south of the Thames, and is due to open later this month. Now for the first time, we’re able to enjoy a sneak peek at what the odd couple owners have been up to. This artist’s impression of the venue immediately portrays a stylish, comfortable and surprisingly (for Beckham, at least) understated venue. With all the exposed brick and neutral colours, it’s a setting that feels less like a plush five-star bistro and more like an urban warehouse. But it seems to work. The restaurant’s menu will be based on a Mediterranean theme, with a daily menu of quality ingredients, sourced from nearby Borough Market and other selected suppliers across the continent. The Union Street Café will feature an open kitchen where diners will be able to observe the chefs performing their magic, before the meal arrives in front of them. While it’s hoped that Ramsay will make a few appearances himself, there’s no guarantee. Business partners David and Gordon are already close friends and can often be seen out together with their partners and children, enjoying family outings and sports events. Only time will tell how great the business partnership really is. We can’t help but wonder who’ll be doing the kicking when things inevitably get too hot in the kitchen. The smart money has to be on Gordy. Doesn’t look like Posh has had much of a say by the looks of things. Will be interesting to see what menu they come up with.